Many people have raised the question of whether or not tanning while pregnant is safe. Some people cringe at the thought of possibly exposing their unborn child to ultraviolet rays, while others are unable to tolerate the possibility of going nine months without tanning. However, what do physicians say about tanning while pregnant? What literature is out there to declare tanning safe or hazardous to the womb? 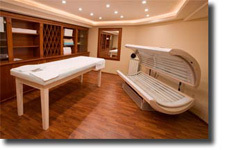 Throughout this article we will examine all you need to know about tanning during pregnancy. As one could expect, tanning while pregnant is an extremely controversial topic, as with many other things that revolve around pregnancy. As you might know, doctors frown upon and recommend against submitting your unborn child to tanning beds. Although there is not solid research on the effects of tanning on your unborn child, the extreme heat itself from the tanning bed can harm the fetus as well as yourself—this fact is definitely true if you are in your last trimester of pregnancy. However, there are many tanning salons that absolutely refuse to allow you to tan if you are pregnant. It says something that a tanning salon is declining your business—obviously if tanning is not healthy for a normal person, it is definitely not recommended for those that are pregnant. Along with the two facts mentioned above, some laws have even been passed by local governments that ban tanning while pregnant. These laws govern tanning salons and require them to ask if their customers are carrying a child—if so, they are legally abided by the local law to deny access to their beds. However, tanning beds are not the only problem. As mentioned above, the heat from tanning is dangerous to you and your baby—a fact that carries over to tanning naturally in the sun. As a result, your physician is highly likely to recommend that you avoid tanning as well as extended sun exposure if you are with child. The best way to look at this situation is to ask yourself this: Would your doctor recommend that you tan in general? The answer is no. Dermatologists frown upon tanning as you are exposed to UVA and UVB rays that can heighten the likelihood of you developing skin cancer. Therefore, if you are pregnant you will not only have your dermatologist recommending you avoid unprotected exposure to the sun and tanning beds, but you will also have your obstetrician and gynecologist explaining the likelihood of potential harm due to tanning while pregnant. If taking a relatively hot bath is not recommended for pregnant women as a result of extensive exposure to heat, then obviously tanning is out of the question, which adds in another factor of harmful rays for you and the fetus. Now that we have thoroughly discussed how tanning if you are pregnant is highly discouraged, let’s look at some of the hazards. Some people believe that those that tan while pregnant will increase the likelihood of their child having a spinal malformation. Furthermore, spinal bifida and neural tube defects may also be seen. Obviously these are very serious conditions; no mother will want their child to have an increased likelihood of obtaining these due to an addiction to tanning. In conclusion, pregnant women should err on the side of caution and avoid tanning and excessive sun exposure while they are pregnant. The tanning is already hazardous and increases the likelihood of developing skin cancer in everyone; however, when an unborn child is involved it increases the risks. Feel free to ask your physical or gynecologist about this topic, but realize that they are more than likely going to advise you to avoid these situations while you are housing a child inside your body—if not indefinitely.